Have you ever imagined what the director of The Fifth Element would do if he sat around his living room getting high on whatever second-rate substance he can find, and then in his drug-induced state decided to put on copies of Limitless, The Tree of Life, 2001: A Space Odyssey and The Matrix all at the same time? One can only assume that those are the origins of Lucy, which is about as demented a sci-fi action film on this sort of scale can get. There’s honestly not much to say about this film because coming out of it, you’ll be so confused and baffled by what you just saw that overall opinions will not be the first thing to come to your mind – aside from the question, “what the f**k did I just watch?” On the one hand, it’s entertaining enough to be on par with other summer blockbusters this year, though on the other there are many things in this movie that neither make sense nor seem like logical paths to take in terms of story or character. Truth be told, it’s hard to favour either hand because there’s so much stuff going on that it’s difficult to comprehend at times. One minute we’ll be locked up with Taiwanese thugs, the next we’ll be at a science lecture as led by Morgan Freeman (whose only job in the film seems to be spouting exposition with his trademark voice). As the titular character’s brain capacity grows closer to the climactic 100% mark it’s as if ours is in neutral, being numbed by the film’s staggering insanity. To say it’s a test on both our patience and our attention span is an understatement. The immediate two things we can comprehend and agree to be outstanding about the film are the action and its leading lady. With the former, Luc Besson gives us a tasteful reminder that he can do a thrilling and competent action sequence, whether it’s a car chase through the streets of Paris, a demonstration of our heroine’s growing powers, or a climactic shoot-out with that always-classic Besson trademark, the bazooka. All of this makes for much entertainment for the audience, and everyone in front of or behind the camera seems to be having a blast trying to convey it on-screen. As for Scarlett Johansson – here reaching the pinnacle of a fantastic year for the actress, including appearances in Her, Under The Skin, Captain America: The Winter Soldier and Chef – she excels at playing both the dumb, naïve innocent at the start and the cold, sociopathic killing machine she becomes for the rest of the movie. Johansson is the ultimate force that holds this movie together with her committed and ferocious performance, not to mention her defensive moves surely picked up from her stint in the Marvel movies. It’s also nice to see not just an original film – i.e. not based on any known source material – make such an impact on both audiences and the box office, but also a female-led action film as well. Sure, films like The Hunger Games and Gravity have done much bigger numbers, but Lucy serves as even more undeniable proof that Hollywood’s misogyny towards women in lesser, damsal-esque parts is starting to seriously strip away and instead be replaced by much stronger and more inept female characters in lead parts, especially in action films. Hopefully, studios can learn from this film’s relative success and get themselves on the right track with gender equality in film – there’s even an ExpendaBelles movie in the works, so unless it proves to be worse than The Expendables 3 (itself a difficult job) then it’s a good start. But anyway, back to the film, or more specifically what doesn’t work about it. For one thing, the whole “10% of brain capacity” myth is here exploited to the umpteenth degree, much more so than Limitless took that plot element, but this film goes a bit too far off the ground in comparison to that Bradley Cooper vehicle and makes the whole myth seem way too farfetched and just plain silly. Like, did you know that your brain can allow you to possess most if not all the powers of the X-Men when you access 30% of it? And enable you to travel through time and space near the end mark, including a brief visit to prehistoric times to see a dinosaur and meet the very first human? If you rolled your eyes just reading those descriptions, just be aware: this isn’t even HALF of what happens in this trip of a movie. A couple of plot holes also arise; for instance, if she is shown to have no problem killing people whether it be thugs or an unsalvageable hospital patient during an operation, then why doesn’t she kill Choi Min-sik’s mobster who forced her to act as a drug mule in the first place, or even that campy British businessman (Julian Rhind-Tutt) who seems to be the mastermind of the whole operation yet disappears completely after his one scene to shine? It seems that the movie may have been over a bit quicker and with less of a threat to innocent police and citizens if she had just done it right there and then, but nope – Lucy does as Lucy pleases. And I’m not just talking about the character there. 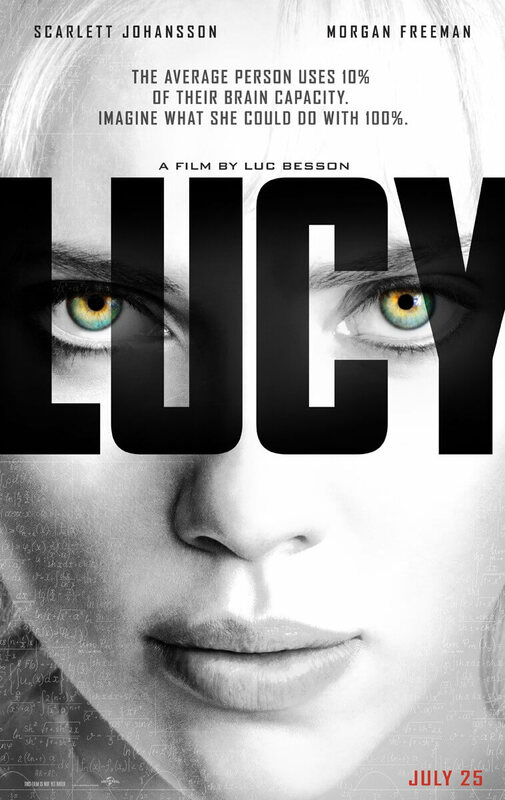 A thrilling display of action scenes and a fantastic lead performance by Scarlett Johansson aside, Lucy is an unnervingly demented sci-fi tale which holds no punches when it comes to displaying its insane ideas and visuals and would most likely cause confusion and stunned silence in all who see it. It’s an experience more than anything, so don’t go in expecting yet another dumb blockbuster or, in fact, anything resembling a sound mind at all. Just go in and hopefully enjoy the ride.